Navigate: Home / Coat Defense / COAT DEFENSE Daily Preventative Powder for Horses. 8 Oz. 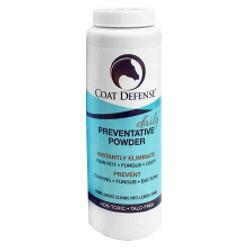 COAT DEFENSE Daily Preventative Powder for Horses. 8 Oz. Cleans and Deodorizes Without Water. Shake On, Work In, Brush Out. Eliminates Odor, Bacteria, Fungi, Rain Rot. Safe. Talc-Free. Made in USA. INSTANTLY ELIMINATES RAIN ROT, FUNGUS, ODOR. COAT DEFENSE treatsthe early stages of fungus and bacteria buildup, forming effective barrier against skin and coat ailments, including Rain Rot, Cannon Crud and yeast infections. COAT DEFENSE soothes and treats sweet itch. Calms insect-related skin allergies. NATURAL DISINFECTANT AND DEODORIZER: The unique and effective dry-action of COAT DEFENSE kills surface fungus on contact. Soothes and protects against infection by removing the moisture bacteria and fungi need to survive and multiply. COAT DEFENSE dissipates odor on contact on animals, humans, and tack. Use under saddle pads, blankets and in therapeutic boots to keep these areas dry, preventing chaffing and odor. EFFECTIVE DRY SHAMPOO. Use COAT DEFENSE as a dry shampoo to help dry up sweat and keep your horse looking and smelling great. Cleans, dries and deodorizes without water! Simply brush COAT DEFENSE through coat, mane and tail to clean and deodorize without wetting the hair coat. COAT DEFENSE retains natural oils, bringing out a beautiful shine without soap, water or chemicals! SAFE FOR ALL HORSES: The ingredients in COAT DEFENSE are 100% non-toxic, talc-free and contain no synthetic, caustic or irritating chemicals. Ingredients: Baking Soda, Arrowroot Powder, Bentonite Clay, Cornstarch, Oil of Peppermint. COAT DEFENSE is FEI- and USEF-compliant and proudly made in the USA. IN THE BOX: One shaker container of Coat Defense Daily Preventative Fungal Bacterial Powder. Net weight, 8 ounces. Click “Add to Cart” to get your supply of COAT DEFENSE Daily Preventative Powder for Horses. 24-ounce size also available.